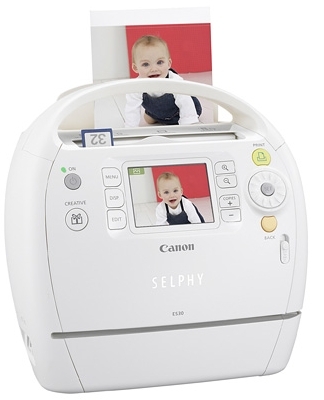 The SELPHY ES3 and SELPHY ES30 are updated model from the previous SELPHY ES2 and ES20 photo printers from Canon. ES3 has a larger LCD screen of 3.5″ while ES30 with 3.0″ LCD screen. With a more compact design, the printers offer Gold and Silver Easy Photo Packs for enhanced printing. 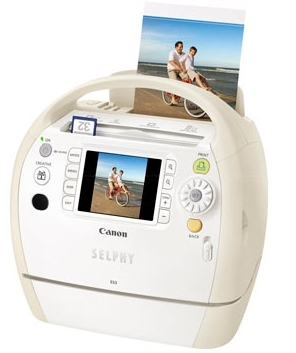 Both the Canon SELPHY ES3 and SELPHY ES30 Compact Photo Printers have been designed with portability in mind. SELPHY ES3 includes 1gigabyte of internal flash memory for storage of memorable photos. This newly designed which carrying handle makes it easy to be carried from room to room. Besides, with the power adapter that being built into the printer’s body, only the power cable needs to be connected. In addition to the integrated ink and paper cartridges found on previous SELPHY models, two new “Easy Photo Packs” are now available that can add a gold and/or silver effect on all your photographs. A variety of 15 types of memory cards are supported, ranging from Compact Flash to microSD cards, which can now be inserted without the use of an adaptor. PictBridge enabled digital cameras can be connected to these compact photo printers. The Canon SELPHY ES3 will be available in end of September 2008 and SELPHY ES30 will be available by early September 2008. The listed priced of SELPHY ES3 is US$199.99 while SELPHY ES30 is sold at US$149.99.